The Save the Children Program sponsored Pastries for Parents for RES this week. 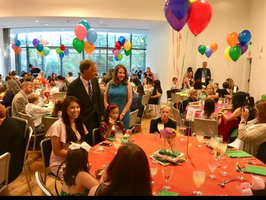 During this time, parents were invited to come enjoy pastries and read with their children. 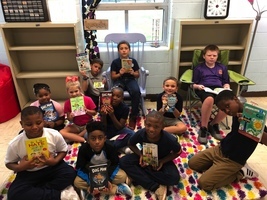 Each student received a free book for attending. THANK YOU TO THE SAVE THE CHILDREN PROGRAM AND OUR PARENTS! 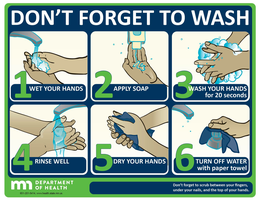 Read 20 RES! 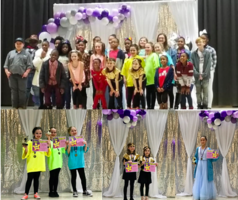 We are SO PROUD of ALL of our TALENT SHOW PARTICIPANTS!! Congratulations to our Fan Favorite and 1st Place Winners: Emma H.,Carlee H., and Briley R.; 2nd Place Winners: Mady C. and Kamdyn G.; 3rd Place Winner Jacqueline T.
We are so proud of you! 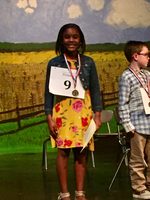 Kamari E. participated in the Lauderdale County Spelling Bee on February 26th at the RHS Little Theater and placed 1st in the primary grades category. 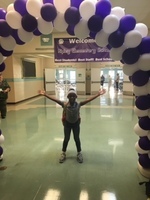 Kamari is a 3rd grade student at RES. Congratulations! 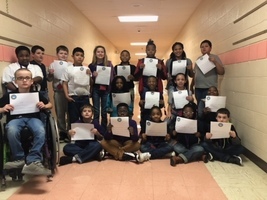 Recently the students in April Oliver's Class did a "Handwriting Without Tears" Activity for National Handwriting Day. They wrote letters to sailors telling them a little bit about themselves and thanking them for their service. The letters are being mailed and sent to the USS John Stennis. The Flag Team at RES consists of 5th grade students. 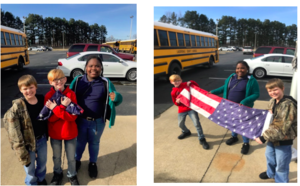 These students are taught by Coach Eric on how to fold the American Flag using proper U.S. Flag Code. Each day they are responsible for raising and lowering the U.S. Flag on our campus. 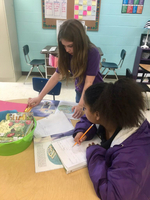 With a partner, students are using the text “Coming to America” to analyze the positives and challenges of Ellis Island while studying immigration in America. We LOVE our school counselors! In celebration of National School Counseling Week, we honored our school counselors with a banner, cake, and flowers. We appreciate ALL that they do on a daily basis. We could not make it without you! THANK YOU MS. SANDY, MRS. SHELLY, AND MRS. BRITTANY!! Thank You to All of Our School Board Members! 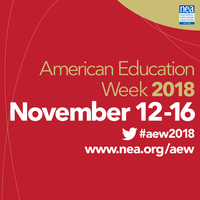 We appreciate our school board members so much! 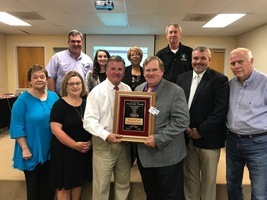 Recently, Ripley Elementary School invited each school board member as well as our Superintendent, Shawn Kimble, and Assistant Superintendent, Sherrie Sweat, to a special lunch. 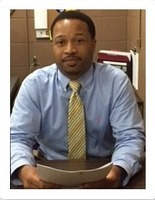 We can not thank each of you enough for your support of OUR STUDENTS IN LAUDERDALE COUNTY!! 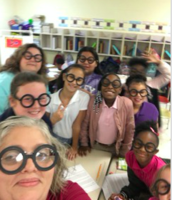 Students in Mrs. Medford's class examined an exploded moment in the book, Hatchet, through “Writer’s Glasses” to see how the author connects the settings, challenges and actions of the main character and what it reveals about him. The DIG Club held a pumpkin painting contest to help decorate the school garden. 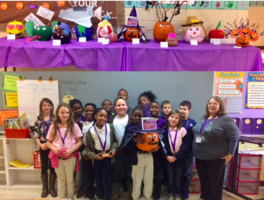 Several classes participated and Mrs. Sidney's 3rd Grade Class came in first place! Students in Mrs. Julie's 4th grade classroom are discussing the deeper meaning of Jack's dog poem in Love That Dog. Students worked together to create a poster and presented their poster to the class. 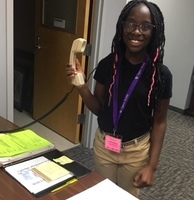 Darianna delivers the Anti-Bullying message to RES students during the morning announcements. One of Tennessee's Top Readers! We are so proud of Jackie Tims! She was one of Tennessee's top readers this past summer. She attended the Kids State Dinner earlier this school year. 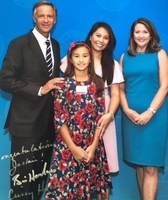 She is pictured with her mom, Governor Haslam, and First Lady Crissy Haslam. 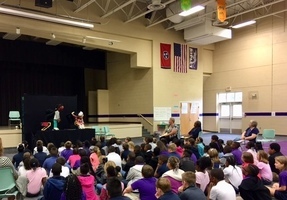 This week 3rd and 4th grade students were presented with an anti-bullying program, Kids on the Block. This program focuses on helping students make good choices to be a ROAR student. Thanks to teachers in the library, Teresa Queen and Kathy Bell, students at RES will observe these caterpillars morph into a chrysalis as they progress on their journey to become butterflies. 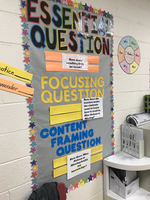 Recently Laura Crook, a 4th grade teacher, found sponsors for her students. 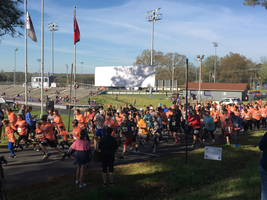 These sponsors are from inside and outside of our community. Each sponsor bought a book and included a special personalized note of encouragement. The students were so excited! 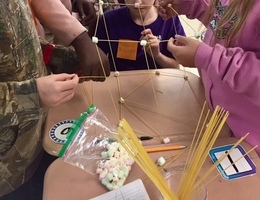 This week 5th grade students worked together as a team to build prototype towers during science class. Students are tweeting about Math! Students in Mrs. Deborah's 3rd Grade Math Class are "tweeting" their answers to morning work! Our students at RES are ready for the new school year! 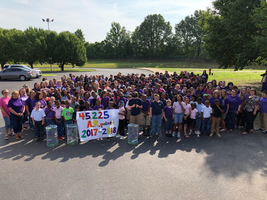 Thank you to the many community members of Lauderdale County that came out to help us welcome our students to the 2018-2019 school year! Students celebrate AR success at RES! RES students celebrated AR points earned for the 2017-18 school year. 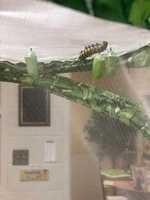 During the celebration, librarian Teresa Queen, released butterflies that were hatched in the school library.